Trim with Kim's blog | Fit Solutions. Move your body. Fuel your brain. Feed your spirit. Revitalize your health. Fit Solutions. Move your body. Fuel your brain. Feed your spirit. Revitalize your health. Parsley – traditionally used to treat digestion, its high in Vitamin A, C, fiber, calcium, iron, magnesium, potassium and riboflavin. Sage – a fantastic herb for sauces and soups, some studies show that mood and cognitive function can be improved. Rosemary – contains powerful antioxidants that can improve healing. This herb can bring a pleasing scent to a room or drawer in a dried herb bundle. Thyme – also source of antioxidants, but traditionally used for relieving mild gas, coughs, and muscle spasms. All do well growing in warm sunny spots outdoors. Rosemary and Thyme, perennials will come back every year once planted. You can also plant them in pots. How can you build in 10 minute blocks of activity into your day? 1. Arrive at work 10 minutes early, after lunch or big meetings, or have walking meetings. 2. If you have a small workplace, take advantage of mild days to walk outside or pick a large place nearby to walk. 3. Make extra time at church, school, or while shopping. 4. Get a walking buddy. 6. At home, walk around the house while talking on the phone, meditation or prayer, or make it a game with the kids! 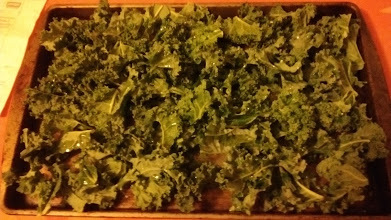 If you are looking for a tasty treat that is unique and an easy way to get in your greens, try this recipe. I bought a huge bunch and only used about 6 long stems to make enough for two. Use a larger pan if you want more and make sure its not to overlap as the lower leaves will take longer. Be sure to shake out the water, I didn’t use a spinner. Cook long enough for them to be crispy to touch but not burnt. 1. Preheat oven to 350 degrees. You can line a insulated cookie sheet with parchment paper. I put it right on the sheet. 2. Tear them away from the stems and tear into bite size pieces. Drizzle with oil and sprinkle with salt, and toss in a bowl. Then line single layer on a baking sheet. 3. Bake until edges are slightly brown but not burnt. 10-15 minutes. 1. Drink Water. Flushing out toxins and hydrating the body systems is the result of drinking plenty of fresh water. 8-12 glasses of water a day is the first recommendation for your detox. 2. Focus on gut health. Is your digestive system too acidic? One of the first steps toward better health is a body that’s more alkaline. As the acid-alkaline balance is essential, with so many bodily functions occurring only at a certain level of acidity or alkalinity, the body is constantly striving to achieve a state of equilibrium. Just a small change in pH can have a profound effect on body functioning. The first step towards great health begins with helping the body become more alkaline. Try Apple Cider Vinegar. While you might think that raw organic ACV is acidic, when consumed, it actually becomes alkaline. Homemade morning tonic: 2 tbl of apple cider vinegar, juice of a whole lemon, and tsp of organic honey. Mix in a small glass of warm water first thing in the morning. 3. Consider a probiotic. Another option to help restore normal intestinal function, is to create a balance in the mircroflora in the intestines by adding a probiotic. These healthy microorganisms can assist in bringing the digestive system into better function. I use Probiotic Restore as its a reputable brand. When selecting your probiotic, be sure to check whether the bottle needs to be refrigerated, as even room temperature can reduce its natural effects. 4. Consult a detox professional. I am not, but be sure to discuss their methods before investing in a program to ensure you are on board with a plan. I recommend Elaine King at simply-healthy.com. Adapted from the Mininmalist Baker. 1. Perce clean sweet potatoes several times with a knife. Wrap with a paper towel, and microwave 3 minutes a time, rotating and repeat until soft to the touch. Let cool. While potatoes are cooking, cook rice or quinoa (see notes for instructions). 2. Add black beans to a mixing bowl and mash half of them for texture. Then add sweet potato scooped from skin and lightly mash, then 1 cup grain, onion, nut meal and spices. Mix to combine. Taste and adjust seasonings as needed. Add more rice or nut meal if the mixture feels too wet. 3. Lightly grease a baking sheet and line a 1/4 cup measuring cup with plastic wrap. Fill the lined measuring cup with sweet potato mixture. Turn over onto the baking sheet and gently press down to mash. 4. Bake burgers for a total 30-35 minutes, gently flipping 15 minutes in to ensure even cooking. The longer you bake them the firmer and drier they will get. I check them at the 25 minute mark. 5. Serve on thin buns (double stack for more bulk) or atop a salad with sliced avocado, red onion, greens, or salsa. 6. Store leftovers in a container in the fridge for up to a few days. Freeze and when needed grab one to thaw for easy snacks or on the go meal. *For quinoa: rinse 1 cup quinoa and add to a saucepan over medium heat. Sauté in a bit of olive oil for 1-2 minutes, then add 2 cups water and bring to a boil. Reduce heat to simmer, cover and continue cooking for about 15 minutes or until tender and fluffy and the water is absorbed. *Optional: Advocare’s Muscle Gain Vanilla or plant protein powder of your choice. I have also used Advocare’s meal replacement shakes which includes carbs so you would need to omit the banana! Healthy Idleness is not laziness. While staying in one day, nursing a cold, and getting caught up on my reading, I found myself watching the few pairs of squirrels who live in my yard. They’re quite comical, looking for nuts to crack, and often getting into tiffs on the branch outside my kitchen window. You might say I was doing nothing. This is something I have allowed myself to do, or not do as I’ve gotten older. Thankfully, unstructured time stimulates what neuroscientists call the “default-mode network” in the brain, where creativity and problem-solving happen. _ Heather Rogers, “The Upside of Downtime” Experience Life Magazine. Idleness stimulates the parasympathetic nervous system, which brings a host of healthful outcomes, including a reduced heart rate, good digestion, and better moods, says the article. Some argue that our society is on the whole “addicted to busyness” – always seeking to get it done, or seeking to stay in constant connectedness to the latest gadget or app. I find that many of my customers are consumed with being, doing, having everything all to the edge, no margin or time for the necessities in life. Studies vary on the average checks to their phones by smartphone users of 85-150 times a day. Social Media accounts for 15-40 of those checks. This equates to 1/3 of a normal day of waking hours. Busyness at work, employees are limited to very strict break times that barely allow for a bathroom break or time to eat. For those of you with activity goals, here are some simple strategies for you: Put away your phone. Try some type of repetitive activity that allows your mind to wander like going for a walk, running, mowing the lawn, weeding, cleaning or doing the dishes. Keep the tv, phone, radio off and just let your mind wander, and wait for the creative juices to begin flowing, and of course move your body.